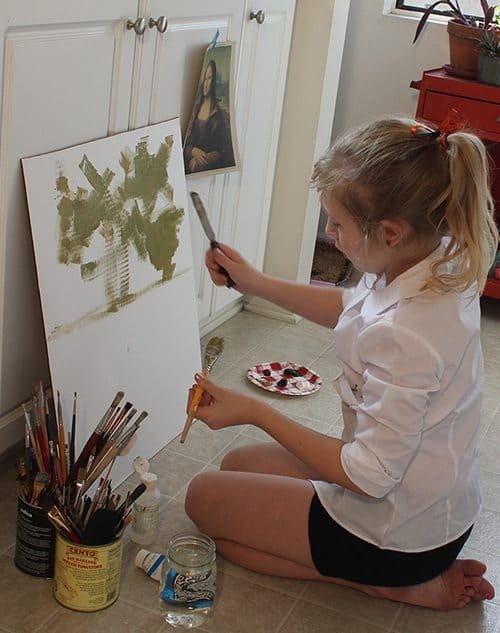 Prev No-Sew Leaf Girl Halloween Costume Next Day of the Dead DIY T-shirt for Kids Tutorial! I’ve had Paris on the brain since I visited the beautiful city way back in 2005. 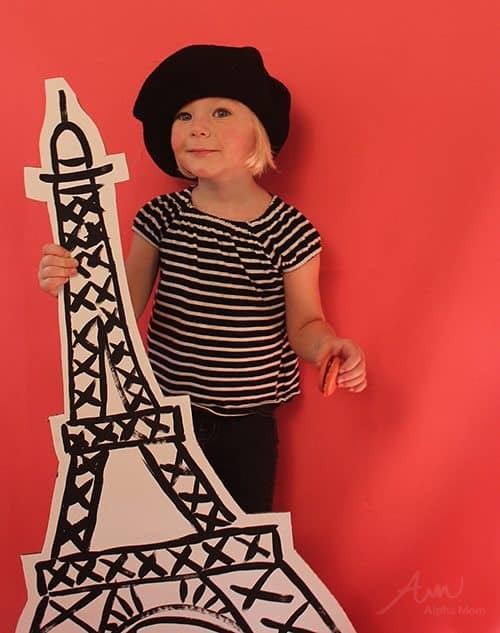 In fact, I’ve recently written a children’s book called Secret Agent Josephine in Paris that will be officially released on November 8th, so when it came time to think up some costumes for this Halloween, my mind went to all things French. Bien sûr! Cute, no? (said with strongest French accent I can fake) Here is how we made them! Creating Leonardo da Vinci’s famous painting, the Mona Lisa, was especially fun. I’d seen a lot of versions of this costume with children’s faces peeking through the canvas but I thought it would be more fun if her frame was free. I was thinking of attaching some straps to the edges of the frame (by drilling an eye-hook into the frame and attaching ribbon) and making it wearable like a backpack, but in the end that was uncomfortable. So we just let Mona live outside her frame, which I think is actually really cool, like she came to life and stepped right out of a painting! We used a really cheap, light (plastic actually) thrift store frame that would be super easy to cart along trick-or-treating. Hey! 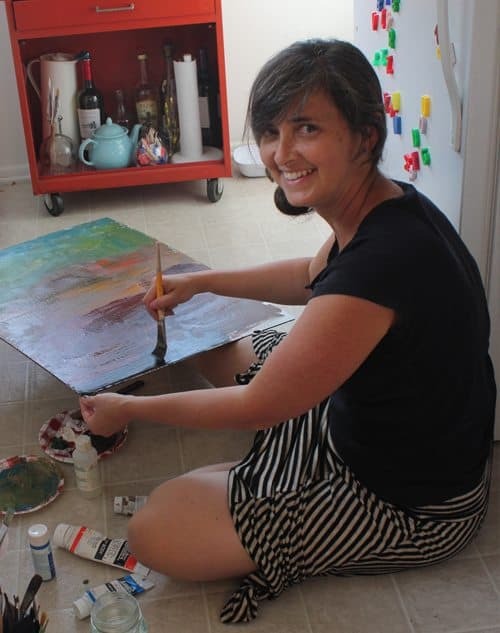 There’s me, painting on my kitchen floor because it’s easy to clean up! To create Mona Lisa’s look we parted her hair in the middle and put some cover-up makeup over her eyebrows to downplay them. Her outfit is a round necked blouse that we found in a thrift store. For her shawl I cut up a velvet skirt that I also bought for four bucks at a thrift store, but really, any draped fabric would work. This one is so easy. 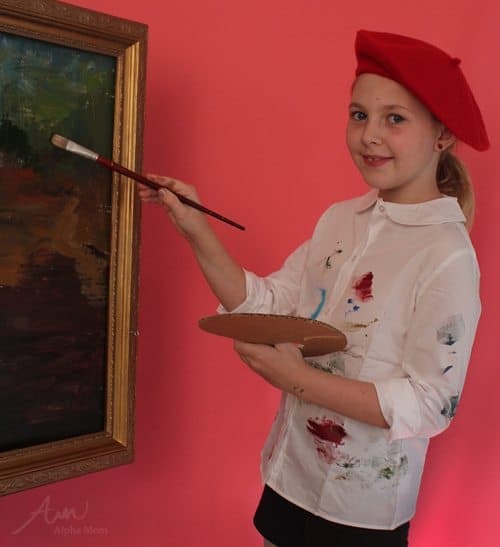 White blouse, a few smudges of paint, a beret and you’re good to go! We added a palette made out of cardboard and a paintbrush, but a sketchbook and a pencil behind your ear would work too. With this look, I was trying to recreate a photo I saw online. 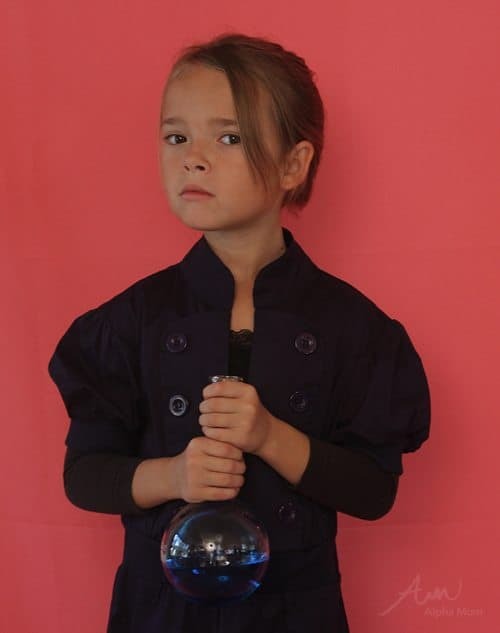 I did buy a lab coat online that would have communicated the scientist look, but I kind of fell in love with 1800’s Marie so we went with a dark blue thrift store dress instead. Add a round-bottomed boiling flask (or a plastic vase if you don’t want your kid carrying around something that might break or spill) and you’re ready to discover radium! And last but not least our little French Girl! She was an after thought but too cute not to include in this post. 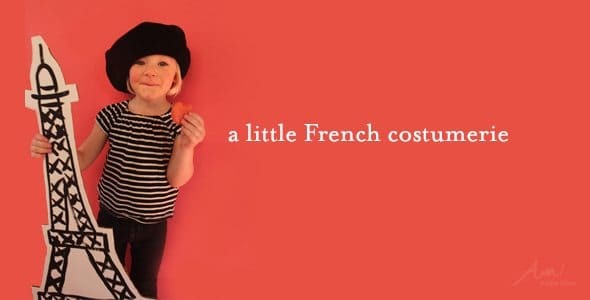 A little French girl costume is pretty much a no-brainer. Any combination of stripes and basic black pants with a beret will work. 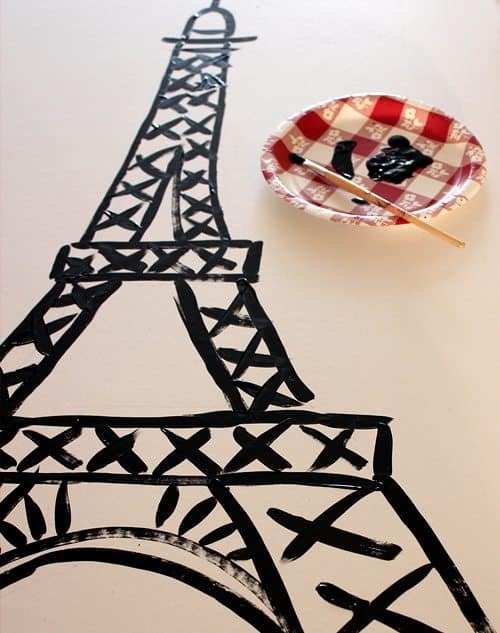 Of course we had to throw in an Eiffel Tower because I am the cardboard whisperer, after all. A macaron is optional. 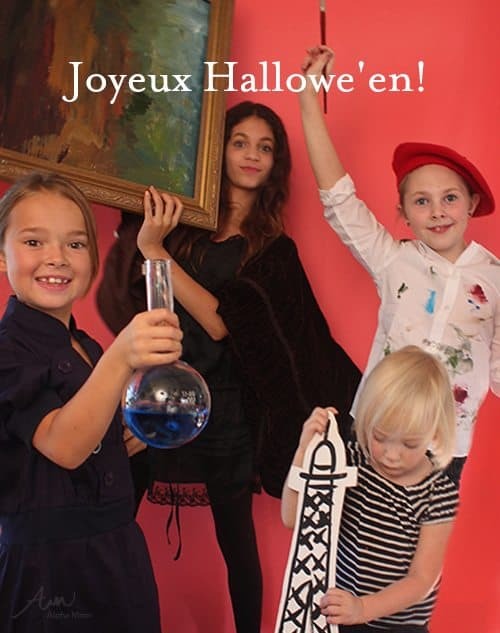 I hope you enjoyed our little French Halloween Costumerie! p.s. I don’t actually speak French. I apologize to those who do. Please feel free to point out my bumbling American errors. 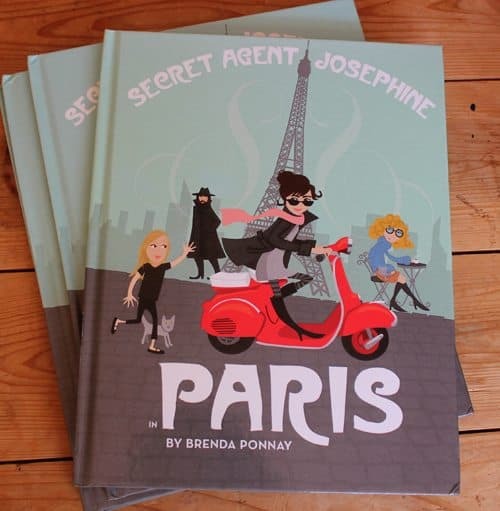 Don’t forget my children’s book Secret Agent Josephine in Paris. Thank you in advance for all of your support! Such clever ideas – and I don’t think I’ll be able to see your Mona Lisa model any other way now! Loved the costumes! 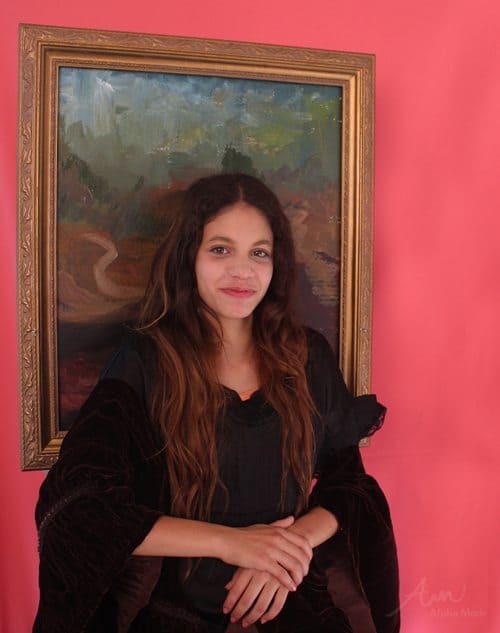 I have a question…how did you keep the frame for the Mona Lisa upright and attached to her? I am really curious! Considering another costume idea using your frame support idea for next year. I put little eye hooks at about shoulder level on the frame and then attached a ribbon across the back. It wasn’t that perfect of a fit. Mona Lisa opted to just carry it for trick-or-treating. I’ve seen others actually create face and arm holes through the canvas and carry it that way. I wanted our Mona to be a little more free so we opted not to do it that way but I think that is a more popular way to go.